The New Zealand Rugby Sevens coach Gordon Tietjens finally managed a smile on his face as his side scored a dramatic win in the Wellington tournament that puts their World Series and Olympic aspirations back on track. The New Zealanders trailed South Africa 21-7 well into the second half of the final in Wellington, before storming home with 3 tries late in the second half to win 24-21. The All Blacks Sevens were seventh in the overall standings after the first two rounds of the World Series and improved throughout the Wellington tournament as new and returning players got back into their groove. Tietjens admits he didn't think they had a chance midway through the second half. "Probably thought it was done and dusted for us really, they'd got too far ahead and we made some mistakes but to bounce back showed a lot of character and was very pleasing. One of those new players was All Black star Sonny Bill Williams, who got more game time as the tournament went on. He'd given the off-load that gave the homeside the win over South Africa in pool play on Saturday night, however a bad pass in the final gave the South Africans what appeared to be a winning margin. It was his first tournament and he knows he still has a lot to learn. "Overall happy with how I've gone, I know I'm still a rookie in this game, but that's the exciting things as it lit a fire inside of me that I won't be able to put out and I just want to train hard and keep learning off these guys." The former All Black and Sevens player Christian Cullen believes the new players have a lot to offer and there is now a good mix in the squad. "This squad here is looking pretty impressive at the moment, the two Ioane brothers are looking awesome and so unless there are injuries, I don't know if you can keep this squad together then they're looking pretty strong for the rest of the year." Coach Gordon Tietjens has stated that he intends to mix up his squad for the next few World Series tournaments, but he says with the exception of the injured Sam Dickson, he will take all of his Wellington players to Sydney for the next round this weekend. "I think what you'll find is that the 15 aside players that have come in, they will certainly be better after this weeks performance, to be good at it you have to be playing it and nothing better than playing in a big tournament like this." 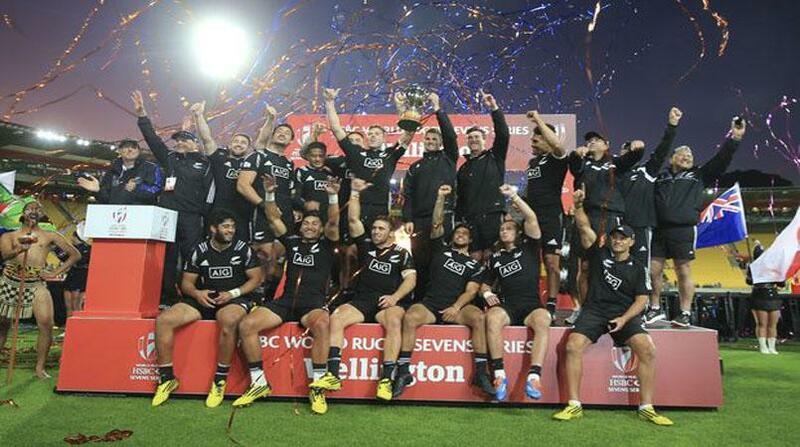 New Zealand has improved to third in the overall standings behind South Africa and Fiji.